Aerial view of the Moon Temple and its location on the rim of the Shackleton Crater. Jorge Mañes Rubio/DITISHOE. As we currently dive into a new era of colonisation and exploitation of celestial bodies, the ‘Moon Village’ —a new open collaborative robotic and human presence on the Moon— has been proposed by ESA’s new Director General as the next possible step in space exploration, the International Space Station being eventually decommissioned in 2024 and Mars being a far too distant goal for human spaceflight yet. Our fascination with the Moon dates back to the most ancient and primitive civilisations. A key element in mythologies of every culture, the connection with our closest celestial neighbour has always been a fascinating and mysterious one. The cadence and consistency of the lunar cycles, its delicate light and its changing appearance have hypnotised us for millennia, even after nearly five decades since the first man set foot on the Moon. 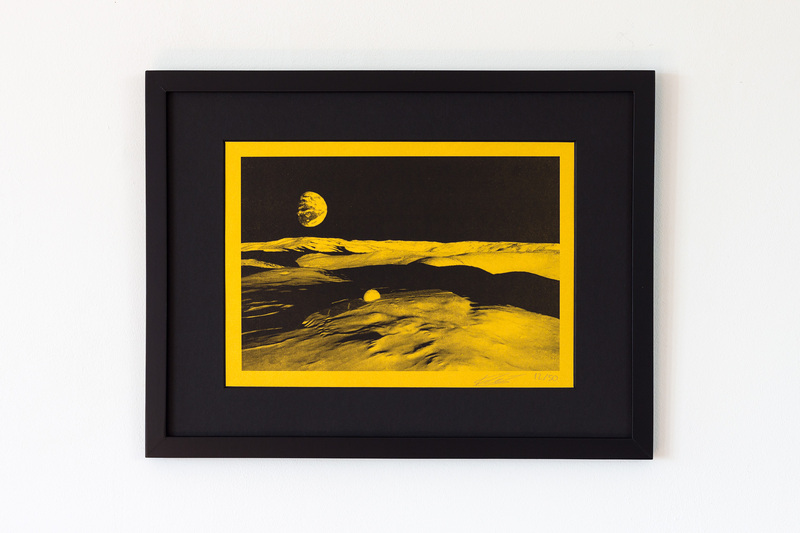 Oddly enough, when appointed Artist in Residence at the European Space Agency ESA in 2016, Jorge Mañes Rubio decided to explore a more human, anthropological and even spiritual approach when addressing a potential future human presence of the Moon as part of his current art project ‘Peak of Eternal Light’. Reimagining a future lunar settlement as a great opportunity to represent an infinity of cultures, nations and values, Rubio decided to revisit our past, looking for the traces that make us all human no matter where we come from in space or time. Joining ESA’s Advanced Concepts Team provided Rubio with the raw substance for modelling environments and creating experiences that he couldn’t have imagined before, his first research bringing up more questions than answers: what are the motivations and needs of new space civilizations going to be? What sort of rituals, aesthetics and new cultural artefacts will be created? When someone is born on the Moon, what culture will he grow into and develop? Instead of seeing it as just a potential site for groundbreaking scientific discovery, sci-fi tourism or the lucrative exploitation of extraterrestrial natural resources, Rubio chose to look at the Moon as a universal and mythical idea. The Moon, unlike Earth, has no boundaries, no divisions, no nations. Do we have a right to change that? And so he decided the best way to symbolize this dilemma was to build a temple on the Moon. A temple to celebrate the Moon as a powerful symbol of unity for mankind. The Moon Temple will be located on the rim of the Shackleton, a gigantic impact crater situated right on the south pole of the Moon. 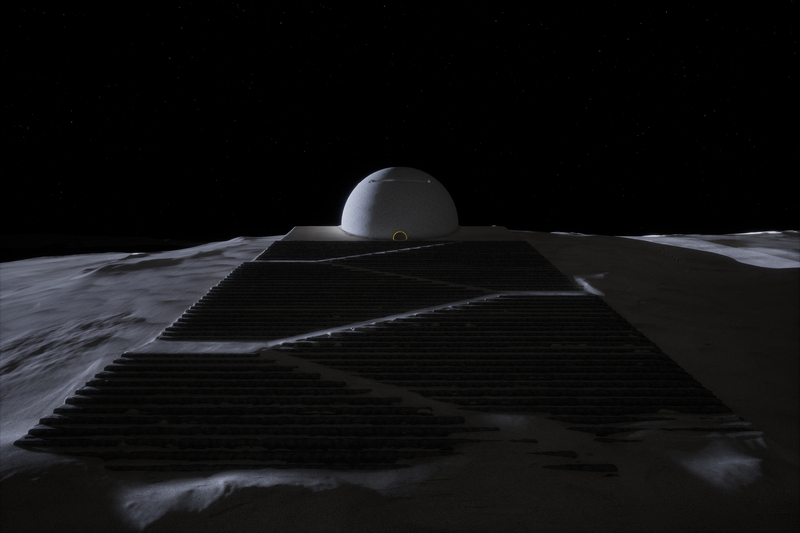 With a diameter of 21km and more than 4200m deep, this imposing location is a potential candidate for a future outpost on the Moon due to its unique lighting conditions. 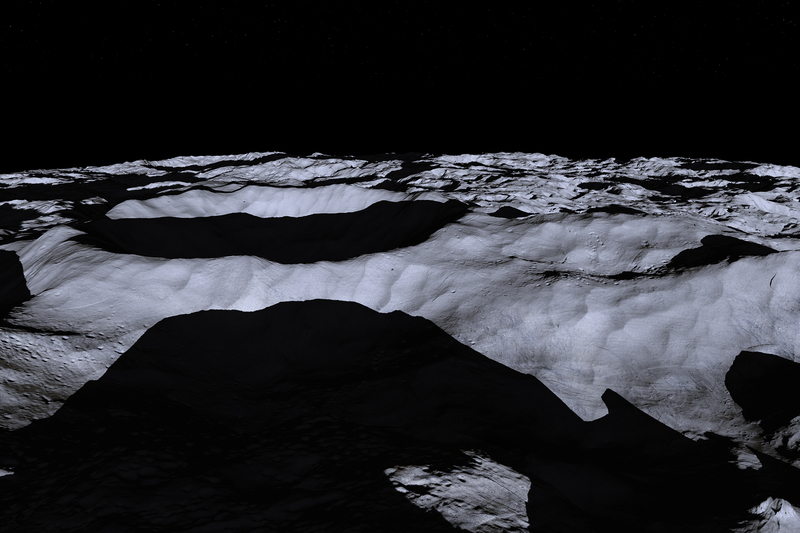 While some of its peaks receive almost continuous sunlight, its interior (one of the coldest and darkest places in the Solar System) may have captured water ice, key for a self-sustainable lunar settlement. 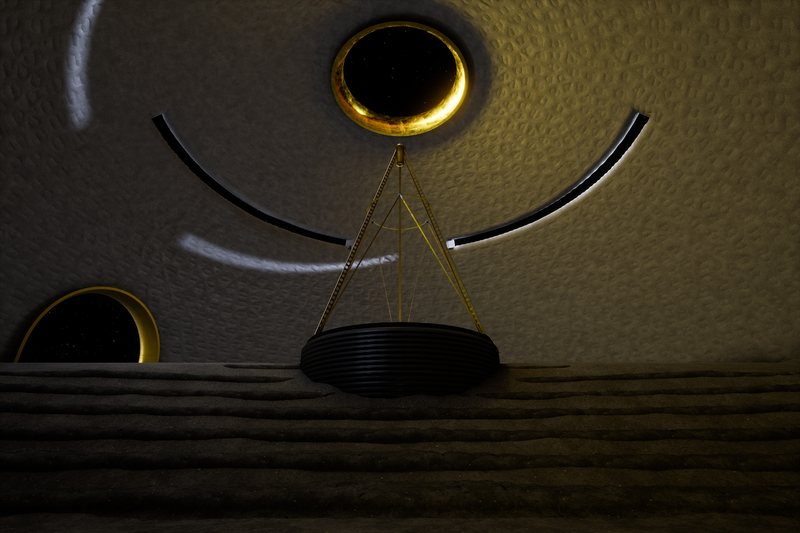 The Moon Temple could serve social, cultural and spiritual purposes and will be built using sintered lunar regolith. Such material and technology will most likely create ‘soft’ structures, resembling the way traditional adobe architecture has been used on our planet for many centuries, again pointing the artist in the direction of early civilisations. The design and visualisation has been created in close collaboration with DITISHOE, inspired by the complex celestial mechanics that operate on the south pole of the Moon and by a great number of architectural styles and monumental buildings, from pre-Columbian temples or Sudanese adobe architecture to Rome’s Pantheon and Turrell’s Roden Crater, celebrating the rich and diverse cultural heritage where we come from. Most importantly, Rubio was inspired by Étienne-Louis de Boullée and Claude Nicolas Ledoux’s utopian architecture, too massive to ever be built but nevertheless influencing many architects after them. With 1/6 of Earth’s gravity, what might seem utopian here on Earth could someday be possible to achieve on the Moon. Taking this premise as a main motto for his project, Rubio hopes to see our interplanetary future as some sort of tabula rasa for our civilisation, a unique chance to find ourselves and do things differently. 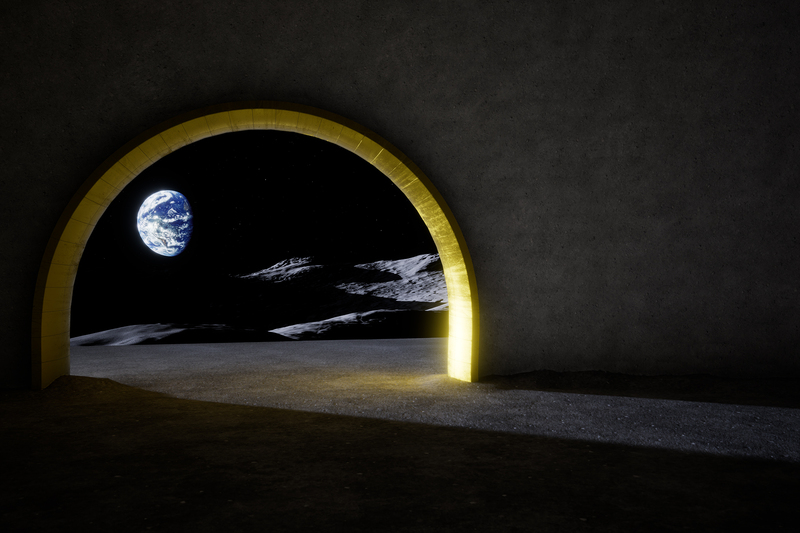 Using universal languages such as science, art and architecture, the Moon Temple encourages us to look at the future of space exploration with a more human, peaceful and embracing perspective. Peak of Eternal Light and the Moon Temple have been created by Jorge Mañes Rubio as artist in residence at the European Space Agency ESA. Spatial design & visualisation in collaboration with DITISHOE. The spectacular 4.2km deep and 21km wide Shackleton Crater located on the South Pole of the Moon. Jorge Mañes Rubio/DITISHOE. View of the Moon Temple and its main entrance. Jorge Mañes Rubio/DITISHOE. View from inside the Moon Temple. Through the main 10m wide central oculus, a lunar liquid mirror telescope gazes into the oldest and most distant objects in the universe. On the left, a secondary oculus allows, when possible, seeing planet Earth rising up on the horizon (Earth rises and stays on the horizon for about 14 Earth days, setting and remaining hidden below horizon for another 14 Earth days). The temple has a communal forum with several levels to be used for cultural and ritual activities. Three horizontal cuts on the upper side of the dome allow natural light to illuminate the temple. Jorge Mañes Rubio/DITISHOE. 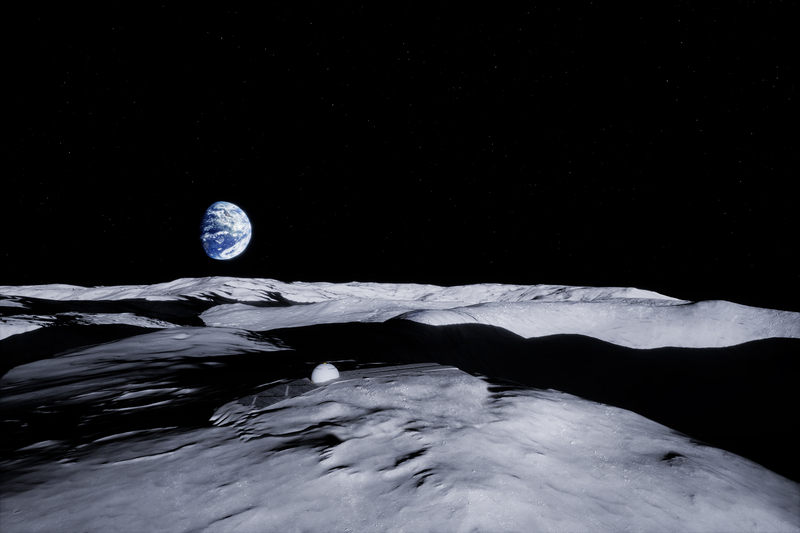 View of planet Earth from inside the Moon Temple (Earth is upside down since the Moon Temple is located on the South Pole of the Moon). Jorge Mañes Rubio. Section of the Moon Temple. Jorge Mañes Rubio/DITISHOE. The Moon Temple, from the Peak of Eternal Light series, 2017. 21x30cm. 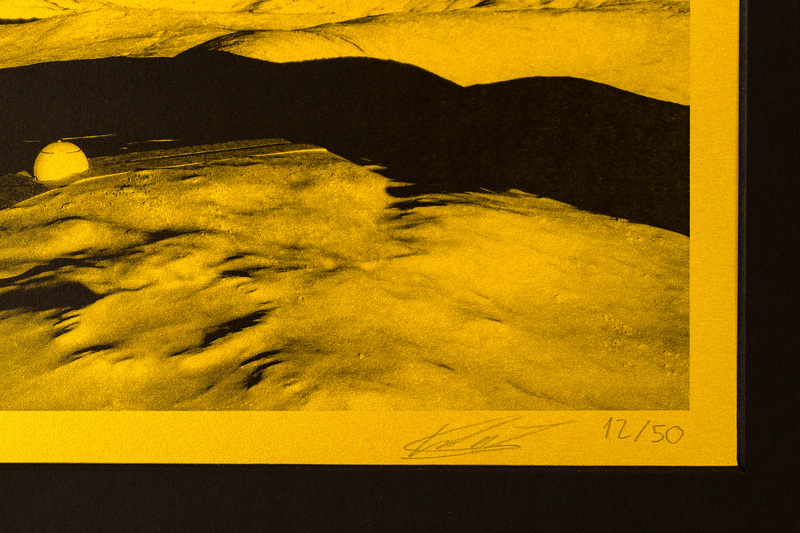 Laser print on Metallic Super Gold paper. Edition of 50. Photos: Sanja Marusic for See All This magazine.